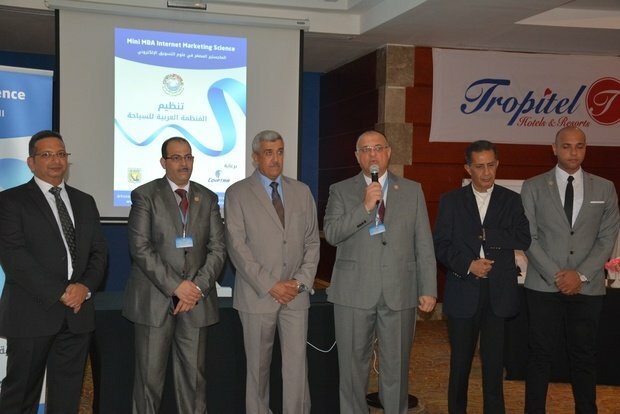 The Arab Tourism Organization offers 30 Egyptian and Saudi experts a mini masters in e-marketing. The Arab Tourism Organization affiliated with the Arab League launched on Friday the mini Masters program in e-marketing. The program is focused on the field of tourism and travel and has 30 participants from Egypt and Saudi Arabia. Deputy Secretary General for training in the Arab Tourism Organization Hossam Darwish stated that the program also aims to develop educational tourism in Egypt. This is due to the fact that the program takes place in Sharm El-Sheikh in cooperation with Egyptian Ministry of Tourism as well as South Sinai governorate. The mini Masters is an initial step towards a comprehensive accredited Masters program that will be announced soon. The program lasts five days and includes lectures by the best experts and lecturers in e-commerce in Egypt and the Arab world. E-marketing expert and head of MRCO Egypt Mohamed Riad said that the main points that will be discussed are: e-marketing strategies, marketing through content, preparing websites for search engines, basics of e-marketing through e-mail, e-marketing through social media, case studies and best practices of companies whose success was due to e-marketing.